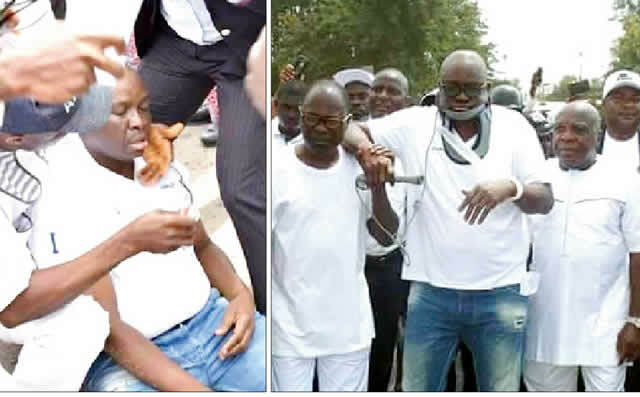 In line with the directives of their national Secretariat, members of People’s Democratic Party in Adamawa state have taken to the streets in protest of police brutality against Governor Ayodele Fayose of Ekiti State. The protesters who first assembled at the state Secretariat of the party, led a procession to the state police command to register their grievances, arising from police manhandling of the number one citizen in Ekiti State. Displaying various placards with inscriptions condemning the police actions, the PDP members called for a comprehensive action to safeguard the nation’s nascent democracy. They condemned the action of the police in Ekiti and charged the Inspector General of Police Ibrahim Idris to constitute a panel of enquiry to prosecute erring officers. Organising Secretary of the party in the state, Hamza Bello and Assistant Secretary, Ayuba Tari said the international community should act against the current dictatorial tendencies of the APC regime. Members of the state executive committee of the party led the march to the police headquarters and were received by the Adamawa state Deputy Commissioner of police in charge of adminstration.